My last physical examination revealed that it was necessary for me to change my diet by avoiding white flour, white rice, white sugar … basically anything that’s been overly processed. All I could think of was not being able to enjoy my favorites - lavash, chorag, paklava, and so on. As I lamented over this medically-induced “sentence’, I realized the only thing to do is adapt – to find alternate recipes using whole grains, whole wheat, etc. The recipe I’m sharing does not include one “white” ingredient; in fact, it sounds like one my doctor would have suggested. It boasts chickpeas, tahini, sesame seeds, and brown rice. Nothing bad here! As I discover more recipes – or convert those already in our repertoire, I’ll post them just for you! 1. Sautė onion in a little olive oil until onions begin to soften, about 3 to 4 minutes. Stir in the garlic, parsley (if using), cumin and coriander, and cook 1 more minute. 2. Add chickpeas and Tahini. Mix together, adding a little water, if necessary, to achieve a creamy, sauce-like consistency. Stir and simmer for 1 to 2 minutes. Add salt and pepper to taste. Set aside. 4. 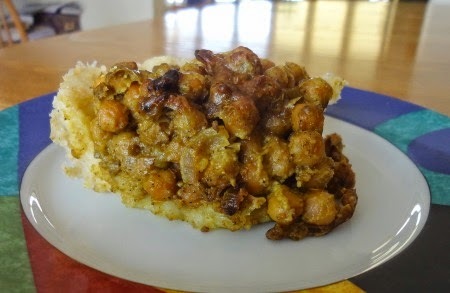 Spoon in chickpea filling, spreading evenly. 5. Bake, uncovered, in a preheated 450° F oven for 25 - 35 minutes. Hi Robyn, you should know that there are several varieties of whole wheat lavash. In fact, the most common kind of lavash in Lebanon and the Middle-East is whole wheat lavash. And with whole-wheat lavash you can make "village baklava" (which basically substitutes sheets of lavash for the phyllo dough). I tried (briefly, since I am at work) to find a recipe for it but could not. I know there is one in Sonia Tashjyan's cookbook, but there might be more floating around on the Internet. Hi Ara, I never thought to use whole wheat lavash in place of phyllo dough. Lucky for me, you're in tune to such things! Do you have Sonia's cookbook? Once her English version is available, I'll be sure to get one. In the meantime, thanks for the suggestion! Thanks for the link! I'll try this recipe soon.